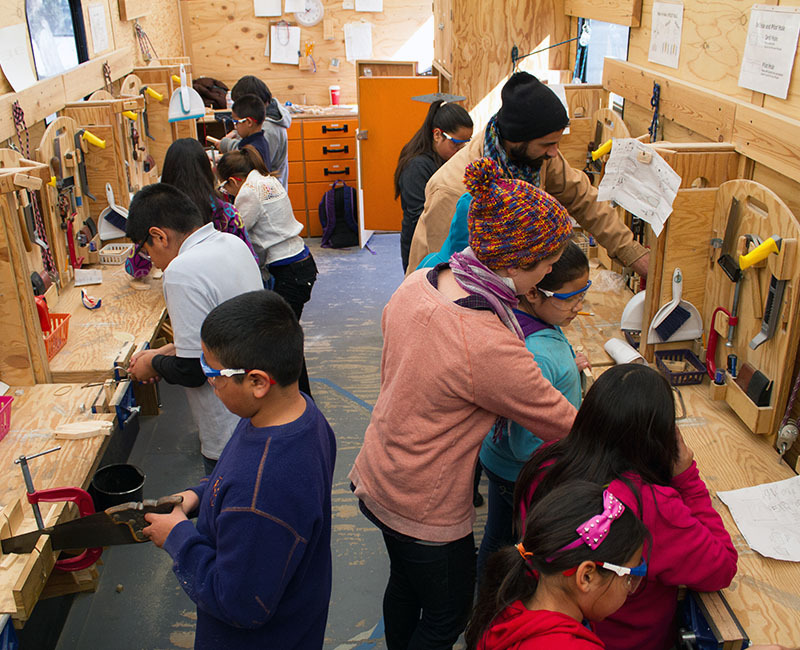 Our Mobile Youth Education program teaches tool-based woodworking design and fabrication aboard mobile classrooms housed in buses and trailers. This program serves youth throughout Los Angeles County, through in school and after school programming, museums, community events, private parties and special events. This program is free for over half of the students through grants and donations. The program takes a holistic approach to integrating core curriculum, particularly Math, Science, and History. This program has now expanded beyond woodworking to other tool-based curricula including sewing, public art and electronics. Mobility allows us strategically to serve at-risk youth where there is the most need. We teach woodworking design and fabrication to youth ages 5+. Each Saturday, we offer free art workshops on-site in collaboration with local artists. About two-thirds of students receive our programming at no cost to the schools or parents through grants and donations. Our mobile classrooms travel all over LA county teaching woodworking design and fabrication to youth. We can come to you!